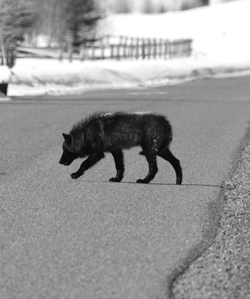 Photo by Curtis Tidwell A black wolf roams through the Wood River Valley in 2009. Hunters in the Wood River Valley are nearing the state-set limit on wolf harvest in the region, having killed 18 of an allowed 25 wolves. The Southern Mountains Region, which includes the Wood River Valley and extends east across the Pioneer, White Knob, Lost River, Lemhi and Beaverhead mountain ranges to the Montana border, is one of the few wolf management zones in Idaho to have a quota. The Idaho Department of Fish and Game reported the kill total Dec. 30. Department spokesman Niels Nokkentved said in an interview that he's not sure whether hunters in the region will kill the remaining seven wolves before the end of the hunting season on March 31. "It's hard to say, but I'm guessing it would depend a little on the weather," Nokkentved said. "If you get a lot of snow, it's hard [for hunters] to get out. If you get too little snow, it's hard to find wolves." Many hunters follow fresh tracks to find wolves, Nokkentved said, and if there is too little snow, wolves don't leave the tracks hunters rely on. "If you have snow cover, it's easy to find fresh tracks," he said. The 18 wolves killed so far are more than the full quota of 10 wolves killed in the zone during Idaho's first season last year, before the season was closed months early. The Southern Mountains region is the closest to its quota of any of the five wolf management zones with a limit. The Sawtooth zone to the north and west still has 44 of its 60-wolf limit remaining, and 22 of the allowed 40 wolf kills in the Salmon region to the north are still remaining. Statewide, as of Dec. 30, hunters had killed 173 wolves and trappers had nabbed 24. This mid-season total of 197 is above the entire 2009-10 season total of 187. The state has also sold thousands more wolf tags than during its first season—32,269 as of Dec. 30. Parts of northwestern Montana were closed to wolf hunting on Thursday, according to Montana wildlife officials. Montana Fish, Wildlife and Parks spokesman Tom Palmer told The Associated Press that hunters filled the 19-wolf quota for a wolf management area that includes Lincoln and Flathead counties. The Associated Press reported last week that at least 122 wolves have been killed by hunters in Montana so far this year, of a statewide quota of 220. At least one wolf is safe from hunters this year—a gray wolf known as OR7, which had been wandering in southern Oregon but crossed the border into California on Dec. 29. The California Department of Fish and Game announced in a press release Thursday that the 2-year-old male was formerly from a pack in northeastern Oregon and has traveled more than 300 miles since he was collared in February 2011. Wolves in California are protected under the federal Endangered Species Act. "Whether one is for it or against it, the entry of this lone wolf into California is a historic event," said Charlton H. Bonham, director of the California Department of Fish and Game. "If the gray wolf does establish a population in California, there will be much more work to do here." This is the first reported wild gray wolf in the state since the last was killed in Lassen County in northern California in 1924. The department states that wolves were once widely distributed through the state, though not abundant.